Effect: The magician gives a demonstration of the well known street con Three Card Monte. Method: There are only two moves you need to learn in order to perform three card monte: The throw, and the bent corner move. The sucker bets money on whatever card they think is the money card, they lose, and you take their money. Of course, being a magician, you take great pains to neither take their money nor make them feel stupid for failing to follow the red card. The first thing you need is a set of cards. I prefer for the two losing cards to be identical, for example, both the four of clubs. This prevents an astute spectator from noticing that you are showing him the same card twice at a certain point in the routine. Next, you need to bend the cards. They are bent lengthwise, so that the backs are convex. When resting on the table, the long edges should rest flat against the table, and the middle of the short edges are about half an inch above the table. You also want to prebend the outer right and inner left hand corners of all three cards..
During the routine, you will bend the winning card in order to make it seem easier to follow. You later remove the bend from the winner and bend a loser. Having the corners prebent makes the bending easier and insures that the bends will look exactly the same in all three cards. I prefer to put both bends in while all three cards are still in a packet. Putting in the lengthwise bend. The basic idea behind the throw is that you hold two cards in your right hand and one card in your left. You toss the lower right hand card onto the table, then the left hand card, and then the remaining right hand card. 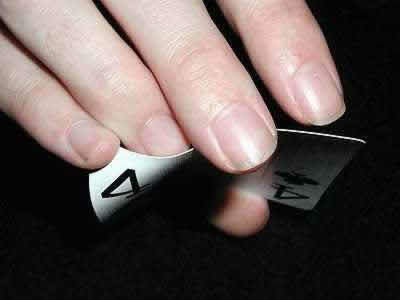 The thing is, when you are ready to spring the trap, instead of tossing the lower card, you toss the upper card first. To do the fair throw, pick up a loser between your right thumb and second finger, at the ends. Then pick up the winner, right below the loser, with the thumb and third finger. Make sure the left long edges of the two cards are touching. Pick up the other loser with your left hand between the thumb and second finger. Turn both hands palm up to show the cards. Turn the right hand palm down, as you move it to the left, and then stop it suddenly as you release the lower card with your right third finger. Now toss the left hand card far to the right of the winner that you just tossed down, and finally toss the remaining card in the right hand between the two cards on the table. 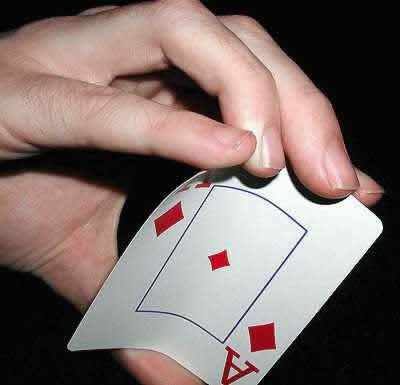 To do the fake throw, pick the cards up as before, but when you make the first toss, let go with your right second finger, and immediately grab the lower card with the second finger, straightening out the third finger. This should look exactly like the real throw. A few points: Do NOT pull the right hand back to the right as you toss the card. It should stop, like it would normally if you were to toss something onto the table. For both the fair and the fake throw, the toss should be part of the same motion as turning your hand palm downward. Some magicians prefer to use cards with an all over back pattern, such as Bee cards, in order to hide the move even further. So much for the throw. Now, for the bent corner move. Start by bending the corner on the winner. Pick up a loser in the right hand, and show its face. Turn the right hand palm down, and pick up the other loser in the left hand. As you show its face, the right little finger pulls up on the corner of the loser the right hand is holding, while the right third finger pushes down on the back of the card. This puts a duplicate bend in the loser. Pick up the winner with the right hand and show it. Do a fair toss. Pick up the winner with the left hand, show it, and toss it back on the table fairly again. This lets the spectators get a good look at the bent corner, both from the face and the back of the card. Now, pick the winner up with the right hand again, show it, and make the fake toss to the left. There is now a loser on the table with a bent corner, and a winner in your right hand with a bent corner. Toss the left hand card to the right, and as you do so, straighten out the corner of the winner by pulling up on the edge of the card with the right third finger while you push down on the corner with the right little finger. ...and finally, drop the winner in the middle. And at last, on to the trick. Phase one : Begin by showing the cards and explaining the game. Do a fair throw, mix the cards on the table slowly, and then turn over the winner. Do this a few times. Without any warning or any change in your pace or handling, do a fake throw and mix the cards slowly on the table. Point to the actual winner, and say something like "You saw it end up over here, right?" They will, of course, disagree with you. Turn it up. Phase two : Immediately say something like "That's okay! You see, most people, if they see the card go over here," Pick up a loser and the winner in your right hand, and fake throw to the left as you say "here". "figure that as long as they don't bet on either of these cards," pick up the other loser under the winner you are now holding in your right hand. Apparently the winner is to the left and you are holding the two losers. 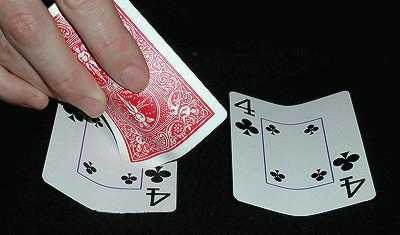 As you say "either of these cards" turn over your right hand to show the lower card (the loser), fake throw to the middle, and then turn your right hand over again to show the same loser again, and drop it to the right. You have, apparently, tossed the winner to the left, and then shown the two losers to be in the middle and to the right. "The thing is" pick up the middle card, the winner, with the right hand, and then the one to the left, which they think is the winner. "when they bet on this card, they lose." Turn over the right hand to show the loser. Fake throw to the left. "It's only when you bet on this card" flip the card in your right hand face up "or this one" use the card you're holding to flip over the loser on the table to the right "that this one's ever going to be the winner." Drop the card you're holding face up, and then turn over the winner. Phase three : Pick up the winner in your right hand. Use it to point to the two losers which are face up on the table, saying something like "You don't want either of these two cards, you want this one." As you point to the losers, press the corner of the winner down against them, bending it. As you say "this", hold the winner up so that the spectators see the bend edge on. Make sure they see it! Drop the winner face down, turn down the losers, and do the bend corner switch described above. After doing this, you have a loser to your left with a bent corner, which they think is the winner, the winner in the middle, and another loser to the right. Now, pick up the loser on the right with your right hand, and the one with the bent corner on the left with your left hand. 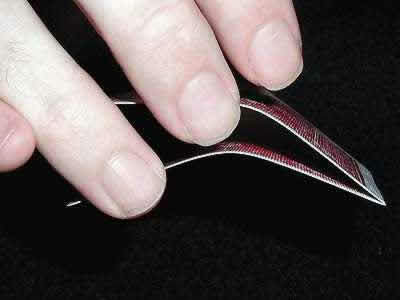 Hold your right hand still as you sweep your left hand over and drop the card with the bent corner to the right. As you make this sweep, glance up at your audience and you should see everyone's head move as they follow the card they think is the money card. Any magicians or just really smart people who are staring at the center card will not move their head. Pick someone who is following the card with the bent corner during this brief upward glance. After you drop the bent card to the right, pick up the middle card and drop it to the left with your left hand, and finally drop the card in your righ t hand in the middle. The winner is now on the left, the loser with the bent corner is on your right, and you have an audience member in mind who is following the card with the bent corner. Address this audience member and ask them which card appears to be the winner. When they point to the one with the bent corner, say "That's absolutely correct, and that's the one most people would bet on." Turn it over. There are several fine points in the routine above which I think are worth discussing in detail. The moves for phase two are entirely Vernon's, but the patter is mine, and I carefully constructed it to imply that the monte dealer, and by extension, the magician, can cause the card you point to to simply be a loser, without any funny business. The stated message of "If you pick this one, it won't be the winner, but if you pick one of the other ones, it will be." implies that I have some supernatural power to make their card be a loser just because they pointed to it. The idea of watching the spectators to see which card they are following is not one I have ever seen described before, but it seems simple enough that it can't be new. When I was a kid and tossed three card monte for my friends I would keep doing fake and real throws until I knew they were following the wrong card (my fake throw wasn't very good... sometimes I went for a minute or two before asking them which one was the winner...). 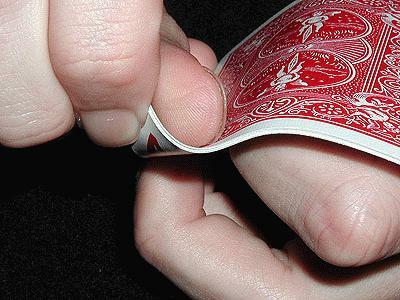 Many magicians simply point to the card with the bent corner and say something like "most people would bet here", in order to eliminate the risk that an audience member might point to the wrong card and mess you up. Personally, I think it is more effective if a spectator points out the card, but I still don't want to take any chances. Watching their heads gives me the best of both worlds. Of course, if you have practiced enough, you should have every head turning to follow the bent corner. If you regularly have people in your audience who don't, you need to practice more. When you ask the spectator to point out the card, asking them to tell you which one appears to be the winner gives them permission to select a loser, and causes them not to take the selection as seriously as they might if you asked them to point out the winner. They know that they won't look stupid if they choose a loser, and so they aren't so worried about it. Immediately telling them "That's correct." tells them that they pointed to the correct card, and did their job correctly. That way they don't feel "tricked in a bad way" when you show that they got fooled. Three card monte is one of the great card tricks you can learn.